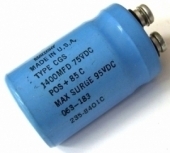 NOS BC Crown C6485-4 10,000UF 100VDC 125V Surge Electrolytic Can Capacitor. 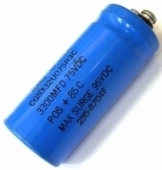 NOS BC Crown C8433-2 10,000UF 110VDC 135V Surge Electrolytic Can Capacitor. NOS Cornell Dubilier 35,000UF 75VDC DCM353U075BC2A Electrolytic Can Capacitor. 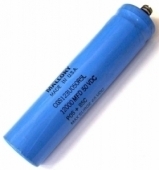 NOS Mallory 50,000UF 16VDC CGS503U016V3C Electrolytic Can Capacitor. 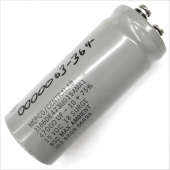 NOS Cornell Dubilier 23,000UF 50VDC DCMX233U050AC2B Electrolytic Can Capacitor. 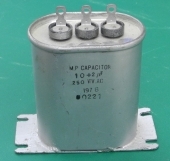 Unused Mepco Centralab 47000UF 15VDC 18VDC Surge Can Capacitor P/N 3186DE473U015AMA1. 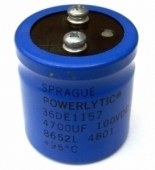 NOS Panasonic GAA 47,000UF 25VDC Electrolytic Can Capacitor. 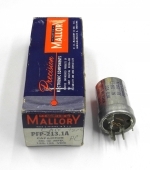 NOS Mallory PFP-213.1A 50UF / 30UF 150VDC Electrolytic Can Capacitor. 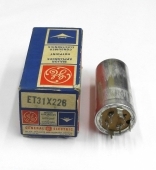 NOS Elna 22,000UF 18VDC Electrolytic Can Capacitor w/Mounting Ring. NOS G.E. 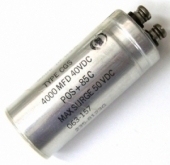 15UF @ 300VDC / 125UF @ 350VDC / 5UF @ 300VDC / 10 UF @ 15VDC Electrolytic Can Capacitor. CP Mfg. 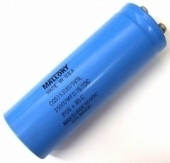 C-EC80-40-30-20 80uf / 40uf / 30uf / 20uf 525VDC Can Capacitor w/Mounting Wafer. 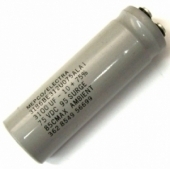 NOS Cornell Dubilier 18,000UF 75VDC 18000122DCME1439 Electrolytic Can Capacitor. 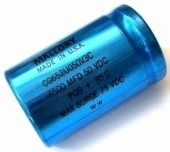 MP 2UF / 10UF 250VAC Flange Base AC Capacitor For Motor Start, Etc. NOS Cornell Dubilier 15,000UF 100VDC DCMX153U100BC28 Electrolytic Can Capacitor. 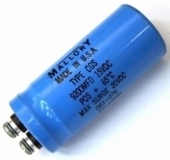 NOS Mallory 10,000UF 75VDC CGS103U075V3C Electrolytic Can Capacitor. 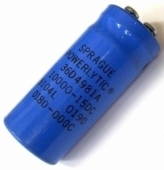 NOS Cornell Dubilier 10,000UF 100VDC 500C103T100BJ2B Electrolytic Can Capacitor For Crown PSA-2, Etc. 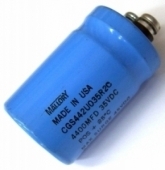 NOS Aero M 135,000UF 70VDC Type CGS Electrolytic Can Capacitor. 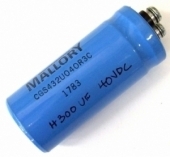 Mallory 800uf 75VDC CG801U075R2C Can Capacitor.